5. Phones answered 24/7 to serve you better. May 11th & 12th @ 6:30p.m. For Ticket information click "News & Events"
EXCITING CLASSES FOR ALL AGES! Call 816-224-5505 to sign up! OUR MISSION IS TO PROVIDE ALL STUDENTS WITH THE SKILLS AND KNOWLEDGE THEY NEED TO ENJOY AND APPRECIATE DANCE AND THEATER FOR A LIFETIME. We believe all students are important whether they aspire to be a professional or whether they take dance for the physical benefit and joy of it. Dance classes promote coordination, strength, balance, good posture, grace and self-confidence. Our goal is to provide a nurturing , fun and safe environment for children and adults. 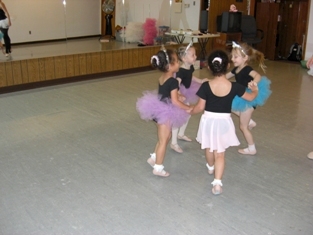 We have a 5,000 square foot facility with 2 large dance rooms and a mid-size dance room. We also have Safety mirrors in our dance rooms. We have 4 bathrooms, a dressing room and a kitchen for students to eat snacks when they are at the studio for extra practices or rehearsals. FAIRYTALE BALLET PROGRAM --We incorporate a Fairytale Ballet Program for Creative Movement, Pre-Ballet and Level I classes. Students learn the stories of fairytale ballets such as Beauty and the Beast, Sleeping Beauty, The Nutcracker, Swan Lake, Snow White, Firebird etc. and learn dances appropriate for their level that will portray different characters from the ballet they are learning. They will also be able to wear simple costumes provided by Blue Springs Ballet Inc. as they portray these characters. We have a performing company which is supported by Friends of the Blue Springs Ballet a non-profit organization that promotes cultural awareness in our community and provides scholarships to company members for various workshops and dance programs. We have performed an annual Nutcracker since 1993 among other classical ballets. These performances are open to the general public. We also offer field trips to school groups. We have invited thousands of children to attend over the years as our guests who might not be able to attend a ballet performance otherwise. We enjoy the letters and pictures we have received form the excited children. It is amazing how many details the children remember from costumes to scenery to the characters that each dancer portrays; every child has their personal favorite. Read this before choosing a dance studio ! Does it really matter where you choose to dance? How do you know which studio is right for you ? There are 3 main things that can make a huge difference in the quality of instruction your child receives and the overall enjoyment and satisfaction of being involved in a dance program. Dance is a very physical activity that requires a lot of jumping which can put stress on bones and joints. Most dance footwear does not provide any cushioning or support so the shock of dance movement can place a lot of pressure on the knees and back of the dancer. The best way to prevent against potential injury is by choosing a studio with a professional dance floor. A floor that absorbs the shock of jumping is ideal. Our studio has a resilient state-of-the-art Neo-shock AGA Maple Floor System. Neo-Shock disks are placed 6 inches apart below two layers of wood which crisscross and a final top layer of Maplewood. This floor is one of the safest dance floors available and is used in universities across the country. It is covered with Stagestep PVC vinyl with PVC closed cell high-density foam backing. Our upstairs studio has a sprung floor with a Rosco Adagio Floor Covering. All of our dance floor coverings are designed to allow dancers to slide with a degree of "controlled slip" but are not slippery so there are less risk of slips and falls. If a dance class has fewer students in it each child will receive more personalized attention, learn more and have more fun. With younger students it is easier for a teacher to maintain control over the class and make sure each student understands the concepts and instructions. Our smaller class sizes make sure that no fundamental concepts are being missed. A smaller class size also allows our teachers to ensure that students are not developing bad habits or improper technique. Our studio limits all of our young children’s classes Creative Movement (age 3 1/2 - 6) to a maximum of just 10 students per class. Magical Kingdom of Dance classes (age 5 - 7 ) are also limited to 12 students per class. We limit our Pre-Ballet classes ( age 6 - 8 ) to 12 students per class . Our Level 1 and 2 classes are limited to 15 students per class. 3. What is the quality of dance training at the studio? Some studios use teen students as instructors. Others use a person who has taken dance lessons but has never been taught to teach. Often students are instructed to do steps before they are physically ready which can lead to bad habits or injury. Some studios do not have a graded system or curriculum to teach students steps in the proper order. All of our teachers are adults who have been trained to teach students in a graded system . This provides students with the proper foundation to reach their goals. Our teachers also attend Dance Seminars and workshops to bring fresh ideas and innovation to their teaching methods which enhance the training their students receive. We provide a nurturing, fun and safe environment for our students.
" Blue Springs Ballet was a second home to me. While I was there. I gained such amazing friendships and a second mother, Melissa Morris. She truly cares about each and every one of her students, and teaches strong work ethic and dedication. Her training at Blue Springs Ballet introduced me to the entire realm of the ballet ; in not only ballet technique, but also the ways ballet affects the world, the multiple aspects of ballet, the passion behind dance and how dance embodies music and the soul. Her training helped me gat accepted into the Boston Ballet and American Ballet Theatre Summer Dance Programs and so many more that I don't have time to list. I used her training and expertise to help me get accepted into several university dance programs, including the University of Utah where I received my Bachelor of Fine Arts Degree in ballet with an emphasis in teaching. She inspired me to become a ballet teacher, which I am currently. Her training also gave me the solid technique and artistry to help me have a professional performance career with the Ballet Theatre of Maryland, and currently, with Contemporary Ballet Dallas. Her care and connection with her students made me feel capable of concurring and pursuing my dreams head on. Blue Springs Ballet is truly an amazing place to learn, to get fantastic ballet technique training, and to form lasting relationships. I highly recommend Blue Springs Ballet." -Rachel Oberg (Stephenson )- former student age 3 - 18 and Blue Springs Ballet Company member. “Melissa, I’ve enjoyed having you as my second mother for the past 15 years. Thank you for giving me a home away from home and a wonderful family. I’m going to miss everyone so much and I will come back to visit as much as I can. Thanks for everything from my first class , to my first recital, to the first pair of pointe shoes, to our last goodbye. Thank you! “As I’m finishing my last year at Blue Springs Ballet, I’m realizing how hard it actually is to let it go. The studio has been a second home to me ever since I was three years old when the girls became my sisters and Melissa became my second mother. Over the years I got the opportunity to become a rose, a jester, Little Miss Muffet, all the way to Sugar Plum Fairy. Every scrunched face that followed a mess up, every smile that followed a perfect turn and every performance that followed months of hard work, is what I will always remember and cherish. As I progress into the future, I will be attending MU and studying Special Education while continuing ballet at Stephens College. I will miss everyone and everything at Blue Springs Ballet. I love all of you.